I’m at the OER meeting in Monterey. The conference line up looks really interesting. My colleagues Patrick McAndrew, Andreia De Santos and I are here because of our involvement in OLnet. Started in early 2009 The William and Flora Hewlett Foundation is supporting The Open University to work with Carnegie Mellon University to develop OLnet. One of the tools we are using as part of the technical support structure for OLnet is cloudworks. A paper describing the background to the setting up of OLnet and in particular the OER and Learning Design research that the initiative builds on is available on the OLnet site. 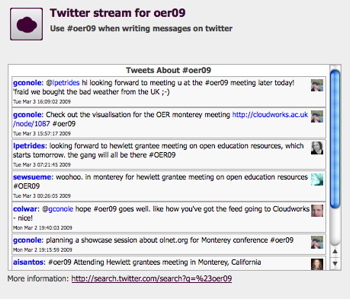 Cloudworks is being used to support the OER meeting here in Monterey. A presentation with audio introducing cloudworks and how it can be used in available from the cloudworks home page. A cloudscape has been set up for the meeting which includes clouds related to the conference - general administration details (agenda, participants, etc. ), as well as clouds for each of the sessions. A set of conference reporters will be scribing the event and entering summarises for each of the clouds. In addition we have set up a twitter cloud and a conference aggregator blog cloud. Adreia and I are planning to use the Compendium tool to capture visually different conceptualisations and discussions associated with the conference. An initiative visualisation cloud mapping the different clouds associated with the conference has been produced. It will be really interesting to see how cloudworks is used during the conference and how that can inform and take forward thinking and developments as part of OLnet’s programme of activities. This entry was posted on Tuesday, March 3rd, 2009 at 7:55 pm	and is filed under General. You can follow any responses to this entry through the RSS 2.0 feed. You can leave a response, or trackback from your own site.